An Australian mother who gave birth to quintuplets in January has released a photo shoot of her five new babies. It took Kim Tucci, 26, just two minutes to give birth to the massive set of new arrivals – four daughters and one son – who were conceived naturally. Doctors had advised Kim to abort some of her five unborn children on health grounds but she refused, going on to give birth to all five babies. Kim and her husband Vaughn, who live in Perth, already have a nine-year-old daughter and two sons aged two and four. Now their family has expanded with the arrival of Tiffany, Keith, Penelope, Beatrix and Allie! 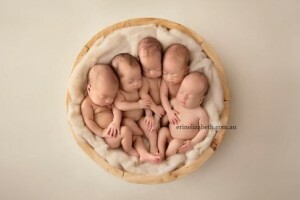 The odds of conceiving quintuplets naturally is approximately one in 55 million. Kim documented the story of her pregnancy on her blog, Surprised by Five. She also described how doctors had recommended that she undergo a ‘selective abortion’ – i.e. abort up to three of her unborn children in order to give the others a better chance of survival. A team of 50 doctors and nurses assisted with the planned caesarean birth and all of the children were born healthy after spending 29 weeks in the womb. 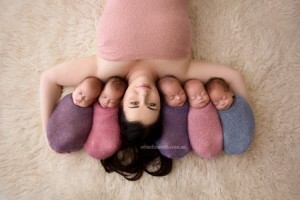 Kim’s pregnancy with her quintuplets was often far from easy. She blogged about pain, extreme discomfort, sleepless nights, constant trips to the bathroom and a 6,000-calorie a day diet to sustain her five unborn babies. But the mum-of-eight also said that all the aches and pains, the stretch marks and hospital stays were worth it, knowing that her babies are healthy. She also thanked her husband for his constant support through her pregnancy struggles. “My husband always reminds me I should wear my stripes with pride and that I should be proud of them and what my body has achieved. Without him I would have broken down a long time ago,” Kim wrote. Now that the babies have come home, friends and family are organizing a fundraiser to help the Tuccis buy a car big enough to transport their entire family. This entry was posted on Thursday, May 12th, 2016 at 4:31 pm	and is filed under News & Commentary, Uncategorized. You can follow any responses to this entry through the RSS 2.0 feed. You can skip to the end and leave a response. Pinging is currently not allowed.